It’s quite hard to enjoy having lunch or dinner with your new friends, roommates or flatmates when you’re vegetarian and the only thing you can order off the menu is salad. When I first came here, I kept ordering vegetarian pizza or pasta. Don’t get me wrong, I love Italian food but after a while of ordering the same thing over and over again you eventually end up wanting to eat something else. Since then, I've discovered a host of amazing vegetarian dishes available around uni. Here is my pick of restaurants and cafes where you can get vegetarian and even vegan food. I've been there only once and I’m already in love with everything about it: great customer service, lovely interior design and amazing food. They serve a range of healthy vegetarian and non-vegetarian breakfast and main dishes such as falafel pitta, halloumi and mushroom wrap, Thai red curry bowel, avocado toast and much more. They also have a vegan healthy breakfast and a vegetarian 555* main dish. *555 means under 500 calories before 5pm for £5 only. Check out their menu where prices and full ingredients of each dish are included, here. One of the greatest things about Umi Falafel is its location, it’s only five minutes away from Queen’s main campus. Umi Falafel is a vegetarian restaurant however some of their dishes are vegan and/or gluten free as well which makes it even better. I’ve been there only twice and, although the falafels are a little pricy compared to my home country in Jordan, the food is tasty and the staff members are really nice. 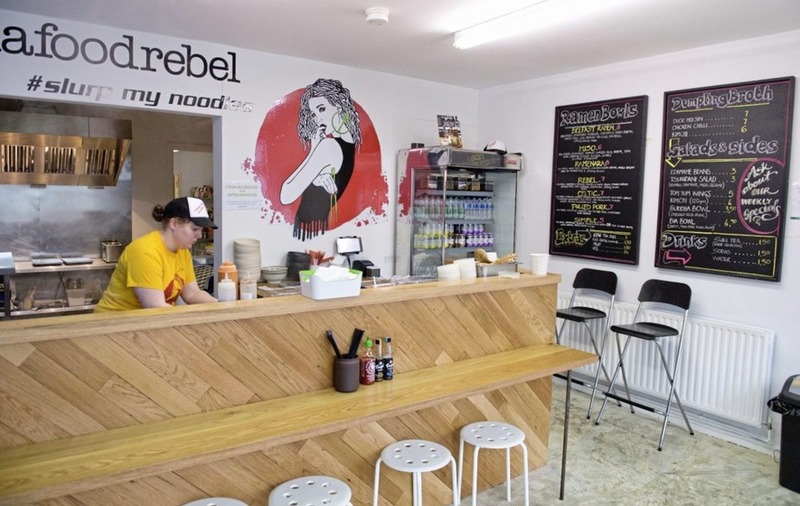 Bia Rebel is becoming something of a legend of the Belfast culinary scene and it's not too far from Campus! The Guardian called it "an £8 bowl of ramen worthy of poetry" it has also won the "Best Cheap Eats" category at the prestigious Observer Food Monthly (OFM) awards. Although it's not a totally vegetarian restaurant Bia Rebel is well worth a visit. Its vegan and vegetarian options are delicious and sure to bring you back for more. You'll find Clements everywhere! You can find it in Queen's Students’ Union, the MBC building and the PEC (Queen’s gym). Clements cafes have a range of vegetarian options and I tried most of them and I personally liked the beetroot falafel wrap. I also loved their toasted bagel and scrambled egg breakfast with cream cheese. Junction is a great choice for students who are in a hurry or have a class or a workshop to catch and want to grab something quick to eat. You can find Junction housed within Queen’s School of Law (Peter Froggatt Centre (PFC)) which is opposite to the Graduate School. You can build up your own salad box or sandwich, or you can grab one of the already made sandwiches, pasta or salads, or you can order one of their daily meals. The prices are relatively affordable and you can actually get a sweet potato falafel box for £2 every Monday from 11am to 3pm (term time only). Don’t have cash? Forgot your credit card back home? Have no worries because at Junction you can pay by your student card, isn’t that amazing? I know you can simply get vegetarian pizza from almost every pizza restaurant, so you must be wondering what’s special about Pizza Express restaurants. Well, one of the reasons why they’re special is their ‘Vegan Giardiniera’ pizza. Whether you’re vegetarian or vegan you still get to enjoy it, on top of that they offer other vegetarian pizza options like Soho 65, Margherita, Margherita Bufala, Padana, Leggera Padana, Fiorentina and Veneziana. You can enjoy their vegetarian Cannelloni or their Broad Bean Rigatoni, and you can order Pollo Pesto without chicken. Pizza Express is definitely one of my favourite restaurants here in Belfast.